I'm really excited by the potential of using textiles in my art practice, since starting my course I have learned so much, from artists utilising materials in a variety of ways to what can be achieved in producing fabrics themselves. I want to share a few artists who really inspire me, who use recycled clothes to produce amazing creations, firstly Nick Cave and his fabulous 'Soundsuits, 2009'. I found his book 'Meet me at the Center of the Earth' in an art gallery bookshop, I was overwhelmed by the bizarre quality of the pieces. 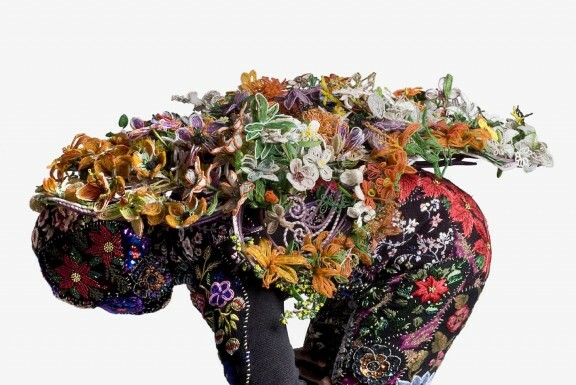 They are living sculptures, used in movement and dance, riotous explosions of colour and form, multi faceted, celebratory, evocative of carnival costumes; joyous, life affirming creations, encompassing references to a variety of cultural sources. Exploring ideas of ritual, ceremony, identity and myth, they embrace many traditions and hold historical references. Its interesting to note that the artist employed a large number of volunteers to help produce the Soundsuits, as there was such an enormous amount of hand sewing involved in making up the costumes. He proudly states that no fabric glue is used in the composition of his pieces. Now onto another favourite of mine, the wonderful Guerra de la Paz, Alain Guerra and Neraldo de la Paz. The duo initially met while working at the same studio and continued as a partnership after doing a successful collaborative piece more than a decade ago. 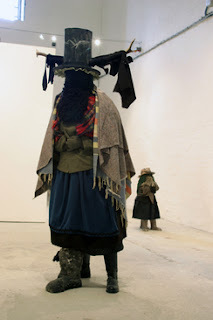 I became aware of them when I visited the Saatchi gallery in the summer of 2010. I saw this incredible piece, called ‘Nine, 2009’ and was mesmerised. 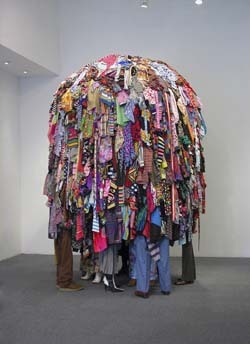 It is a large scale imposing sculptural installation, depicting nine figures standing in a circle piled up with clothes, my immediate reaction was to smile when I saw it, and then I wanted to investigate it, enjoy its multiplicity, to touch it and look up underneath it. I found it a very powerful and thought provoking which led me to research their work further. I immediately searched online to see more of their art, I went as far as to befriend them on face book, which is an excellent arena for keeping abreast of whats new in the art world. 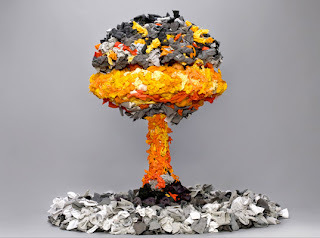 With this piece, 'Atomic, 2009' clearly depicting an atomic cloud we can appreciate the use of found textiles again. The artists used discarded materials set for landfills, then carefully categorise the clothes into colour groups to be used in layers building up into these impressive structures. The ethos of using the cloth, they have stated, was to invite viewers to experience the art more intimately through their remembered associations with fabrics in various forms. The subject matter is one of the threat of nuclear war, underlining the ecological resonance of the choice of using recycled products. Another artist I admire, Laura Ford, who we were lucky enough to have as a guest lecturer in Second year of art in 2010. Laura studied at Bath College of Art and Design, now known as part of Bath Spa University, many years ago, and has gone on to be internationally recognised. She works in a variety of medium, largely in sculptural form. As with the previous artists she reuses materials in some of her pieces. This is a picture of 'Glory, Glory' made for the Venice Biennial in 2005. From a series of large sculptures depicting these ambivalent, quite eerie creatures embodying stereotypical motifs from various cultures of anti heroic beings. From Russian spies, tramps, outsiders, to prisoners and terrorists. Ford assembled these pieces using old clothing to successful portray the characters. Here, in 'Wreckers, 1999' we have a small, childlike figure, kitted out with tool belts and a masked head. Dressed completely in brown woollen fabric, alluding to a uniform. The figure is from a series showing similarly dressed childlike creatures in various states of play around a gallery, one climbing a rope, another crouching, she plays with the role of freedom fighters by representing them as children at play. She told us in the lecture she gave that she was hugely inspired by her children playing and their dressing up sessions. 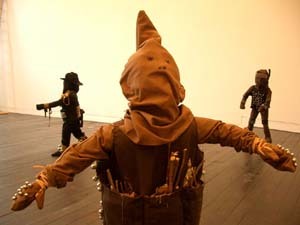 Her oeuvre of work has a bias towards using child sized figures disguised in an array of forms. This adds to the ambiguity of the subject matter that the work is addressing. The last piece is figure from an installation of sculptures called ‘Headthinkers, 2003'. Again, small figures made from recycled fabric, this time with large heavy stoneware donkey heads. The figures seem weary almost lifeless under the weight of their enormous heads, my initial reaction was to think that they were children from a bygone era fallen asleep during a party game... I then wondered if the artist was commenting on society’s obsession with intellectual pursuits. You can see that the kind of art I have shown is rather theatrical and playful, with multi-­layered meanings. I applaud the use of discarded materials, each of the artists has used fabric consciously for the features they hold, either to soften a dark subject matter or to exude decoration. The artists are also aware of the archaeological aspect given by using old textiles, which can either heighten or distort the message of the work produced. To me, using old unwanted clothes and fabric compounds the concept of life's cyclical nature it resonates the globalisation we are experiencing in an ever changing world; I feel it can also remind us of past histories and cultures for us to research and enjoy. clare tigoglu. Awesome Inc. theme. Powered by Blogger.